Geoscience model infrastructure provides architecture and services for building physics-based numerical models and combining multiple models into a coupled system. Examples of model infrastructure are software libraries and frameworks that provide data structures and functions for parallel data transfer and grid interpolation, define a common interface for model components, manage a model's control flow, abstract details of parallel programming, or provide supporting capabilities such as configuration management and file I/O. The special issue of GMD is dedicated to exploring all aspects of model infrastructure integration and interoperability. Model infrastructure integration is the software engineering process of adopting an infrastructure package into a numerical model's codebase, to address new scientific requirements, enable interoperability with other models, or to improve a model's performance. 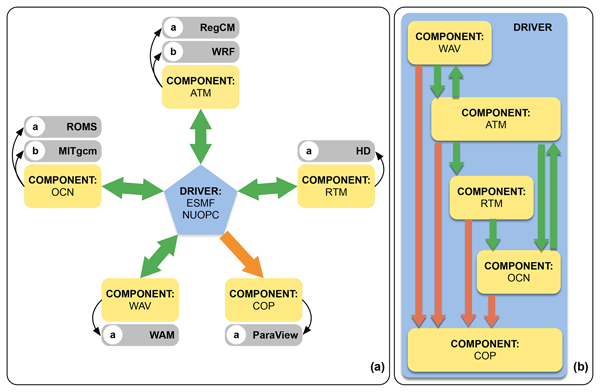 Model infrastructure interoperability is required whenever multiple infrastructure packages must interact in some way in a coupled system, for example, to couple model components that originate from different scientific communities into a single cohesive system. Topics of interest for this issue include but are not limited to the following: the design and implementation of geoscience model infrastructure software; experience reports on integrating infrastructure into models; modelling systems that span scientific communities; framework interoperability, metadata and semantic mediation; performance on emerging hardware platforms; configuration and build management; and tools that support infrastructure integration, code refactoring, verification, or debugging. The OASIS software package provides capabilities that allow different models to be coupled together to carry out new scientific investigation. This is particularly useful in climate model simulations where atmosphere, ocean, sea ice, hydrology, land, ocean wave, chemistry, and other types of Earth system models are often coupled together. The OASIS software package is used by several groups around the world, and this paper describes features of the latest implementation. We present a coupled regional climate system model. The COSMO CLM regional climate model is two-way coupled via OASIS3-MCT to the land surface, regional ocean for the Mediterranean Sea, North and Baltic seas and an earth system model. The direct coupling costs of communication and horizontal interpolation are shown to be negligible even for a frequent exchange of 450 2-D fields. A procedure of finding an optimum processor configuration is presented and successfully applied to all couplings. In nature, the many processes that make up the Earth system take place simultaneously, for instance the condensation of water vapour into clouds, and the blocking of sunlight by those clouds. In computer simulations, these often take place in sequence. We demonstrate how to make these processes also execute in parallel in computer simulations. This should prove a large benefit in the new era of computing, where arithmetic does not get faster, but we can perform more of it in parallel. We propose a butterfly implementation for data transfer. Although the butterfly implementation outperforms the existing implementation (the P2P implementation) in many cases, it degrades the performance in some cases. So we design and implement an adaptive data transfer library that automatically chooses an optimal implementation between the P2P one and the butterfly one and also further improves the performance based on the butterfly implementation through skipping some butterfly stages. In this paper, we show that different compiling setups can achieve exactly the same (bitwise identical) results in Earth system modeling, and a set of bitwise identical compiling setups of a model can be used across different compiler versions and different compiler flags. Moreover, we shows that new test cases can be generated based on differences of bitwise identical compiling setups between different models, which can help detect software bugs and finally improve the reliability.